VEHICLE IMPACT: Well this one didn’t pass through our office but came very close. At our old office at Broadway & Cambie, the driver of this SUV was supposed to be backing out of the parking spot but had the vehicle in “Drive”. 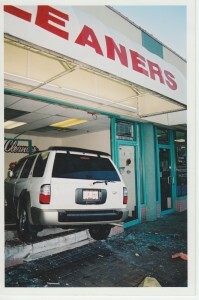 The vehicle jumped the curb and flew into the dry cleaners narrowly missing a customer and employee. 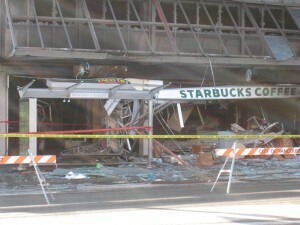 Luckily, no one was injured but the storefront was seriously damaged. This is a good example of why you need to review your car insurance annually. The driver’s Liability coverage should have covered all the damage. This one hit close to home (literally). A couple of years ago during a heavy winter storm, my neighbor’s metal roof from their rear patio was lifted OVER their home and into the front street two houses down the street. 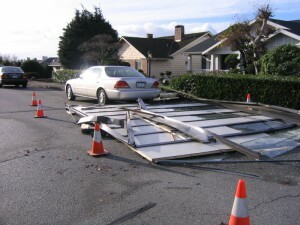 I heard the huge crash and went outside to find the roof had hit a couple of cars. Luckily it was at night and no one was around. This was not one of our customers but likely, their home insurance would have covered their damaged roof and damage to the neighbor’s cars. On February 13, 2008, the Taco Del Mar restaurant and other buildings near our office, suffered major damage due to a fire and explosion. Our office had a dozen broken windows but no other major damage. We were back in business the next day although the gas company shut off our heat for two weeks. The hi-rise next door was closed for months undergoing repairs. The only person injured was the man suspected of starting the fire. 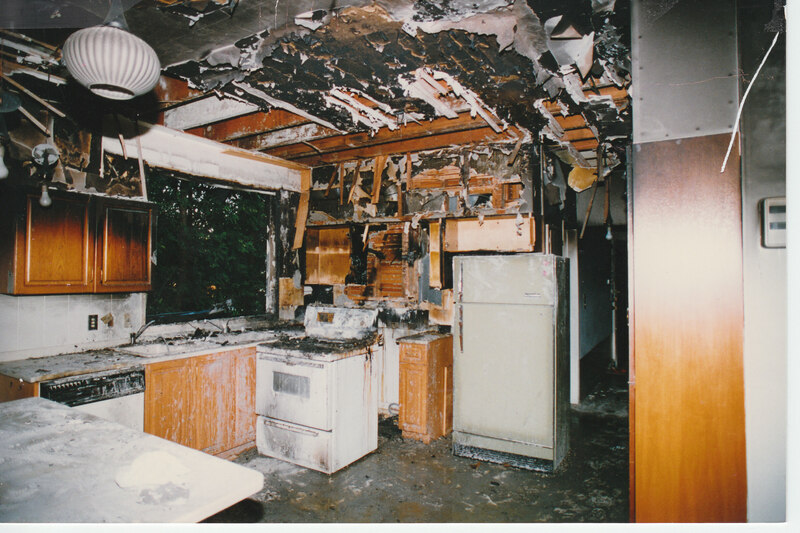 We’ve seen many fires over the years, the most common starting from the kitchen due to deep frying. Other causes would be electrical, barbeques and human error. 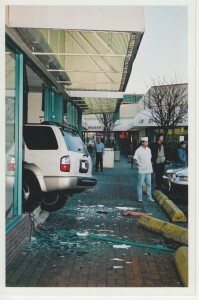 The resulting smoke and water causes much of the damage. After a fire, the occupants must move to a temporary residence and much of their personal belongings have to be packed up, cleaned or replaced while the dwelling gets repaired. 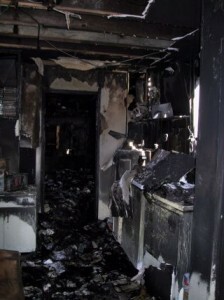 The above photos are from a kitchen fire, electrical fire and human error. All claims were paid. Top: TOTAL CLAIM PAID: $85,000. 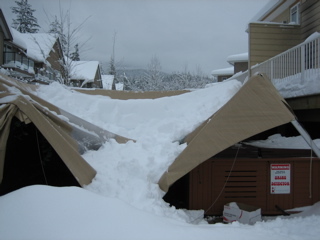 Here’s a lovely patio tent that couldn’t handle the weight of the snow. This claim was covered and a new tent was purchased, but not all home insurance policies cover weight of snow. For example, many rental homes do not have this coverage. TOTAL CLAIM PAID: $7,600. 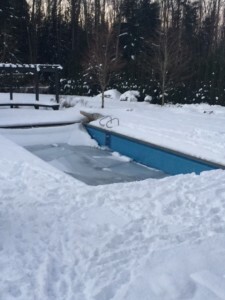 Here’s a swimming pool cover that collapsed due to the weight of snow. 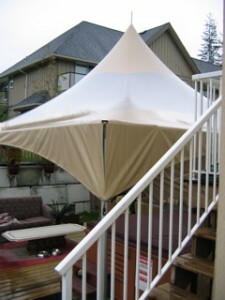 The cover and liner was fully covered under the customer’s Intact insurance policy. 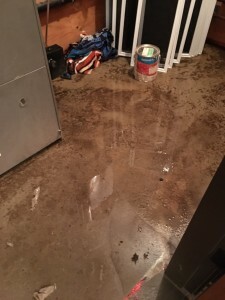 WATER DAMAGE: One of the most common claims we see are flooded basements due to sewer back-up. Sewer back-up is usually caused by collapsed drain tiles and pipes or tree roots blocking the flow of the water. Other causes of water damage are: burst pipes, burst hot water tanks, overflowing tap water, cracked toilets. 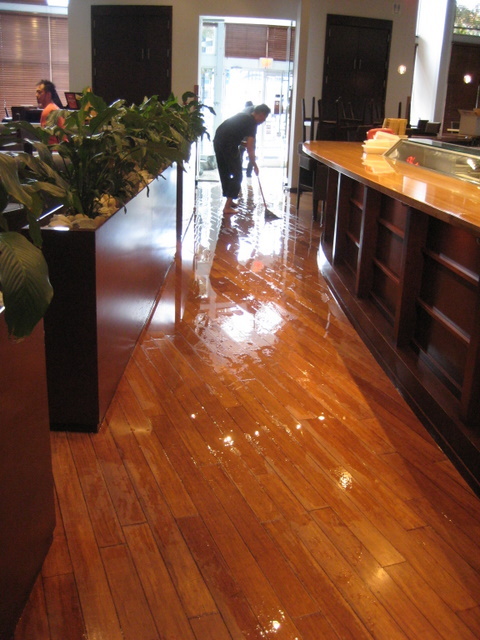 Here’s a photo of a business which suffered a flood due to a faulty water tank. The entire flooring was replaced as well as part of the drywall and the loss of income while the business was closed. The entire claim was paid. Floods caused by rising water (ie: heavy rainfall) is usually not covered and insurance for this type of loss is not available for homes. Also leaking roofs and pipes are usually not covered as these are maintenance issues. TOTAL CLAIM PAID: $56,000. The other two photos are of a customer’s home where the sump pump failed and sewage water backed up into the basement. Intact Claims Dept were called and they sent On-Side Restoration to the home at 3AM to clean up the black water. Our client was involved in a “rear ender” crash which she was hit from behind and pushed into a car in front of her. The three drivers stopped after the collision but the driver in the rear car only gave her first name and left the scene in a hurry. 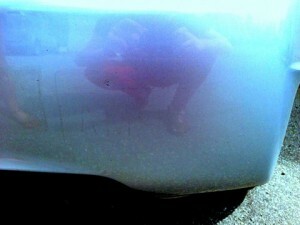 Our client noted the rear car’s licence plate number before the driver took off. Our client (in the middle car) also noticed a faint imprint of the rear car’s licence plate on her bumper and immediately took a photograph of the imprint (see photo). This was crucial evidence in the settlement of the claim because the rear car’s driver denied hitting our client. To make matters worse, the driver of the front car was claiming injuries. Our client was initially deemed “100% at-fault” for the collision to the front car. 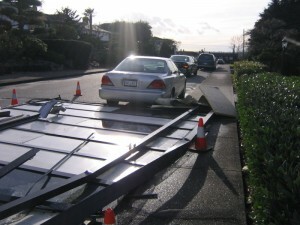 After submitting the imprint photograph to ICBC and evidence of damage to our client’s bumper caused by the rear car, ICBC overturned the decision and found the rear car “100% at-fault” for damage to all the cars involved. you can see the faint imprint of the letters “AM” left of centre in the above photo. This is from the licence plate of the car that rear-ended our client. …. Theft of your personal property is a type of loss which can usually be prevented if the right precautions are taken. For example not leaving your stuff in the car; or making sure your garage is secured. Computers are the #1 stolen item. Theft claims were once the most common but have been happening less as most people put preventative measures in place such as burglar alarms or storing items in the trunk of a car. Some of the Theft claims we have paid over the years: $130,000 of computer equipment stolen from a school. $20,000 of window screens stolen from a vacant commercial building. $40,000 of jewellery and $5000 cash from a home. and numerous break & enter claims from homes and businesses. 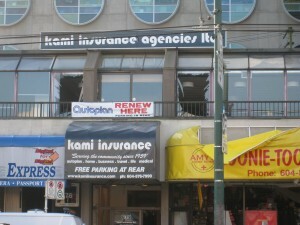 Kami Insurance Ltd have been the victim of Break & Enter and theft of computers on several occasions over the years. 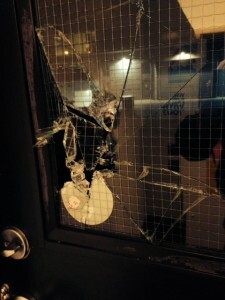 Both times it was not worth claiming although there was broken glass due to forced entry. Do video surveillance cameras help? Our security cameras have recorded numerous criminals in the act of theft and break-in. Such as the customer who stole an insurance decal from our front desk (we called him and the decal was returned), the two thugs who broke into our office in January 2014 and the thief who stole items from our employee’s car. Unfortunately, we’ll never know if these criminals were prosecuted but the video provides us with proof of the crime and in the case of the stolen decal, the return of the goods. VACANT HOME: the clients moved out of their home but did not inform their insurer of the change of occupancy. 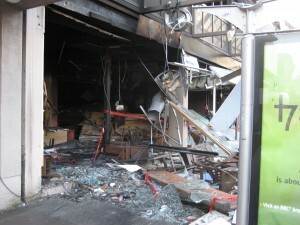 Four weeks later, a fire started due to damaged wiring. Damage was not covered. 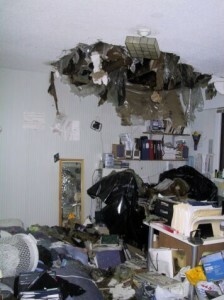 If the homeowner had informed the insurer, the policy could have been amended to cover damage while vacant. BURST FROZEN PIPES: The homeowner went on a winter vacation and did not drain the plumbing or arranged for daily checkups. After four days the heater shut down and the pipes froze & burst. Damage was not covered. You must either drain your plumbing or arrange for daily checks if you are away for four days or longer. 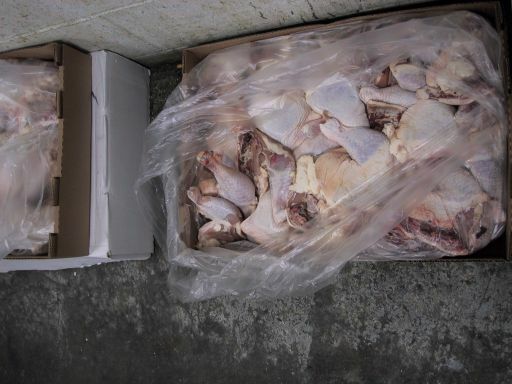 ILLEGAL ACTIVITY: The homeowner was producing illegal drugs in his basement. A fire started due to the poor wiring and damaged the home. Damage caused by illegal activity is not covered. AIRbnb or business use of home: The homeowner rented out part of the home for AIRbnb use. The shortterm tenant forgot to turn off the water when filling the bathtub and caused extensive damage to two floors. 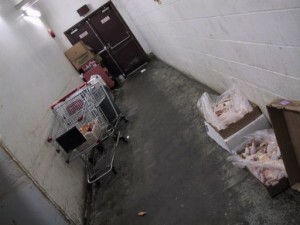 This was not covered due to the insurer not being informed of the change of occupancy. A “shortterm rental” rider to the policy would have covered this damage. CO-INSURANCE: The homeowner didn’t want to pay for the cost to insure the dwelling to 100% of the “replacement value” so he chose to insure to 30% only, and therefore only having to pay about 30% or the actual premium. The house suffered $100,000 damage due to a fire. Since the homeowner did not meet the co-insurance condition, only $30,000 of the loss was covered. OVERLAND WATER (Flood): A creek beside the home overflowed due to heavy rainfall. The water flowed into the home. Damage was not covered. 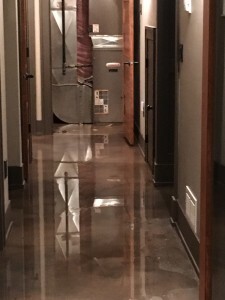 The homeowner should have purchased “Overland Water Damage” coverage available since 2016. Some of these losses could have been covered if the broker was informed in advance.